Width the jananese and German advandced technology and techins. 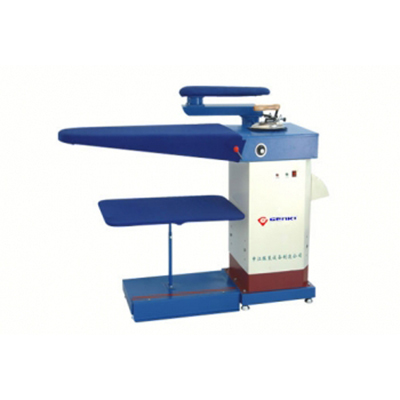 CS 18-1 Pianostyle Ironing Working table is well designed, carefully produced and strictly tested. As a newly buldt generation. It has the following advantages: wet auto - dry & exhausting strong, wind - absorbing. Low noise, energy saving now, beautiful shape, etc. it is welcome to many customers. CS 18-1 Piano - stype ironing working table users the centrifugal wheel, special ironing electro motor, which form the excellent system of the particular wind tunnel, with the electric heating device used in both the table surface and the mold, It helps to lower the speed of the stream congulayion, which makes the surface of the table clean ans improves the quality of the ironing. CS 18 -1 Piano - stype Ironing working table has a special designed winddoor lightly, you can change the wind absorbing of the wind easily.